Tabbed conversations are great, especially for folks that have more than a handful of chats going on at the same time, however I wish there was a way to sort them alphabetically, so it's easy to find your contacts. 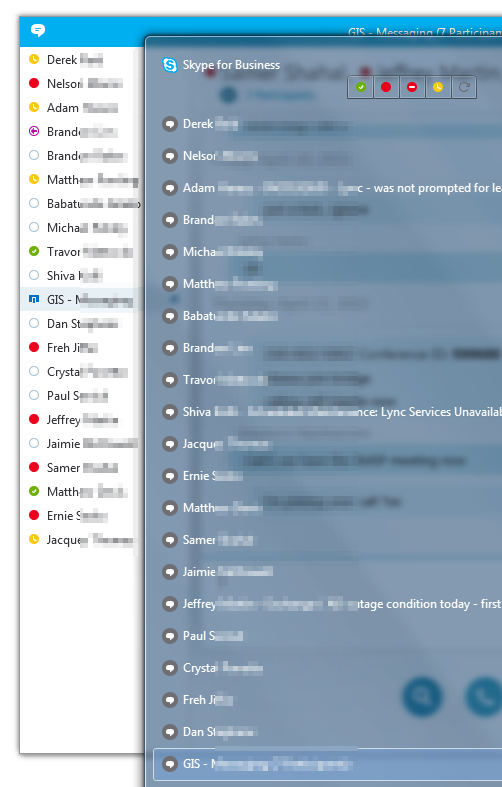 Even the popup window when you hover on the Lync/SfB program on your task bar seems to order the list by placing the most recent new IM session at the top, but as you see in the screenshot below, the tow lists don't exactly match up either. Skype for Business client - Tabbed conversations. Conversation window in the background, and the taskbar list when you hover on the client, in the foreground. There is a ton of good information and lengthy guides on the actual in-place upgrade process for Skype for Business, so no point regurgitating it here. Instead, I've provided a couple of gotcha and tips to help make your upgrade go a little smoother. Make sure you have at least 32GB of free diskspace before running the in-place upgrade. The installer will verify that as one of the pre-reqs too. Shutdown and restart the Powershell window. If you had the Lync Management Shell console open while your server was getting upgraded to SfB, make sure you shut down that window, and start a new SfB Management Shell window. The fancy new start-cspool and other new SfB command will not run in the old version of that shell (which has also been overwritten by new bits). This one will hopefully be fixed in an upcoming release, but you MUST have the Windows Firewall Service running the first time you run start-cspool command after the upgrade is complete. The Windows Fabric seems to do a bunch of configuration updates at first launch, and if the Wnidows Firewall is not running, it will fail to start. On the console windows you will see the start-cspool command fail with something similar to this error. mismatch of the security binding between the client and the server. Start-CsPool : Please make sure at least 2 machine(s) are in running or starting state to achieve fabric network ring quorum from the following machine list. Also makes sure Windows Fabric Host Service is running on those machines. If you also look at the events under Microsoft-Windows-WindowsFabric, you will see it referring to FabricDeployer.FirewallManager.EnableFirewallSettings. Just start the Windows Firewall service, and let the Fabric do it's thing. After the pool is up, you can stop the service if you want to. Check your back-end database versions to ensure they are at the proper versions. Run Test-CsDatabase -ConfiguredDatabases -SqlServerFqdn pool.domain.com | select databasename,installedversion,expectedversion to verify, and if need be update the DBs use Install-CsDatabase -ConfiguredDatabases -SqlServerFqdn SQLServerFQDN -UseDefaultSqlPaths -verbose or using the Topology builder. Run the SfB Setup Wizard at the end on each FE to enable/disable all the new changes in the topology. Recently we noticed a rash of Event ID 32050 & 32026 on the FE servers. Started all of a sudded in the middle of the work day (so not related to reboots or patches). The MS engineer who I worked with was aware of the issue, and said its a know bug, that should get resolved in the next server update. 32026 - Conference rollover failed. Cause: Conference rollover occurs when an MCU becomes unavailable or is restarted. A rollover failure indicates that no MCU is available for the requested MCU type. Resolution: This operation will be automatically retried. This error can be ignored if MCU outage is planned. Otherwise ensure that at least one MCU for the specified type is available and that there are no connectivity issues between this server and the MCU. 32050 - A Create Conference request sent to an Mcu was rejected. It will be retried but if this error continues to occur conferencing functionality will be affected. Cause: Overloaded or incorrectly functioning MCU. Resolution: Ensure that the Mcu is functioning correctly. 41027 - The content file store is full or unavailable, and no more data can be written to it. Content file store location: \\FS01.domain.com\ConfLyncShare\1-WebServices-7\CollabJournal Reason: The specified network name is no longer available. Cause: The file store either has run out of space or is unavailable. Resolution: Verify write access to the file store or make more space available on it. Note that this event is logged only once. When the problem is fixed a success event ID=41028 will be logged. Cause : The front ends are attempting to access a file lock under the existing handle and not creating a new file handle to access the share. Note: Sometimes the Backup Service can also lock a file in the file-share in a similar fashion, and restarting that service on the Primary or Backup pool can also resolve the lock issue. In those cases, you will notice a "stale" file in the CollabJournal folder. KB2825678 seems to be causing issues with Outlook 2010. After this update is applied, Outlook 2010 crashes at launch time. Related to a Facebook add-in for Outlook called Microsoft Outlook Social Connector. Uninstalling this update from the PC, fixes the issue.